Further details for Brett Dixon are displayed below. He was appointed in 2015 as a solicitor member of the Civil Procedure Rule Committee and has recently been asked to serve a further term in that position He is a member of their subcommittee dealing with reform of the court system and implementation of the pilot schemes for the online court system. Recently he has been a member of the sub-committees redrafting the Disease and Illness Pre-action protocol for resolution of package travel claims. He is also a member of the HMCTS professional engagement group. Brett is an active member of the APIL executive committee and was elected by the membership of APIL to be the vice president 2016-2017. 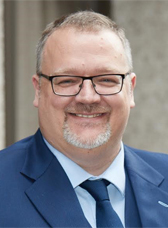 Brett became president of APIL in May 2017, and agreed to serve a further term as President, being appointed for a second time at the annual conference in 2018. He delivers training regularly on behalf of APIL via webinars and face to face courses including at the annual conference and other conferences. Brett also tours the UK annually writing and delivering the ‘PI Update’ and ‘Accidents at work’ update courses. Brett has also acted as a spokesman to the media for APIL, recently given evidence at a select committee in Parliament on the 2017 proposed whiplash reforms, the discount rate in 2017and attended the House of Lords on behalf of APIL to brief opposition ministers on health and safety issues. He was previously the secretary of APIL's costs and funding special interest group for three terms. He has practised as a solicitor since 1999. He has a wealth of experience in representing both private and trade union clients. Brett has written many published articles including for the Gazette and JPIL. On a personal note he is the father of a disabled daughter. - act as ambassador for APIL with other organisations, where appropriate, in liaison with the Chief Executive.